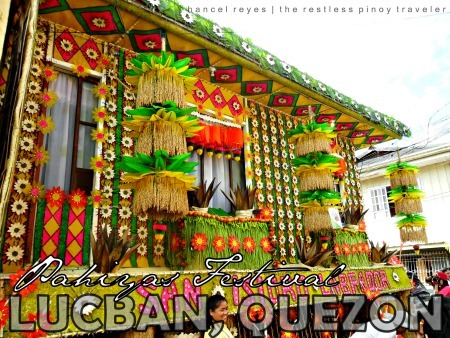 This town’s famous and most colorful harvest and thanksgiving “Pahiyas Festival” kicked off this week, seasoned with the age-old traditions of joyous fiesta, flea market, “kiping” or leaf-shaped buntings adorning houses and the brick-roads with the “toktok” or ornately-designed rickshaws. Lucban Mayor Celso Olivier Dator said this year’s festivities which will culminate in a grand celebration and merriment on May 15 will showcase the town’s bountiful harvest through a “tiangge” or flea market at the town’s Rizal Plaza. Dator said the market trade fair also symbolizes what “Pahiyas” is all about – thanksgiving to God for the farmers' bountiful harvest and as homage to the patron saint of the farmers and agricultural workers, San Isidro de Labrador. Around 110 booths are open to the public and tourists who can buy a variety of the town’s agricultural products like the famous “Lucban longganisa” and other food specialties like the “pancit habhab,” kaldereta, and native delicacies like broas and tikoy. The town mayor expects more tourists this year than last year’s five million and sought the support of the engineering district of the Department of Public Works and Highways (DPWH) to expedite construction of the alternate routes and by-pass roads in the run-up to the May 15 grand festival. Dator also disclosed that town officials and organizers are set to introduce the configured tricycles, pedicabs and the environment-friendly e-trikes, the age-old precursors of the “toktok” or rickshaws replete with adornment. The plan will enhance the colorful ambiance of the Pahiyas houses which are adorned with the traditional “kiping” or leaf-shaped buntings and farm produce. According to Dator, around 10 barangays adjacent to the poblacion have planned to transform their localities into the Vigan-like heritage sites using the traditional mode of transportation like the horse-drawn “calesa” (carriage), carabao-drawn and bamboo and wooden-made carts and the “toktok”. He said the project proposal includes the renovation of some roads into the heritage site brick roads and promenades. The festival highlights also include the grand parade with the beauty pageant winners of “Mutya ng Lucban” and “Ginoo at Binibining Parikitan Pahiyas 2017”. Food demonstration and cooking competitions on suman-making, arangya-making, kiping-cooking are also staged. Talent competitions will also feature the Grand Finals of D' Voice Kids, Pahiyas Daytime, Pahiyas Kutitap and other native games.